Guest-contributed post by Razlan Manjaji. Sheung Wan may not feature prominently on your holiday itinerary to Hong Kong. After all, this town located to the west of Hong Kong Island boasts few shopping malls and tourist spots. Unless you are a fan of dried seafood, of which the streets of Sheung Wan are brimming with, you probably would not visit this area. Go off the beaten path in Hong Kong. But, if you take a step closer to this town, where locals and expatriates alike jostle for the same living space, you will catch a glimpse of the other side of Hong Kong that is often hidden from tourists. And by this I am referring to the rich and diverse food culture. Although yours truly have been living here for just slightly over a year, I am somewhat unadventurous in sampling the vast array of food available at this foodie heaven. Yet even with my somewhat limited gastronomical knowledge of Sheung Wan, I can easily churn out an entire day’s worth of food adventures for those of you who love to eat your way through a holiday. Let’s loosen that belt and get started, shall we? What better way to start off your day than with a hearty traditional breakfast? In the morning, head over to Dim Sum Square, located at 88 Jervois Street. This tiny eatery is a hidden gem where you can get dim sum at very good prices and the service is extremely friendly. Highly recommended are the beef balls (HK$10), chicken and Chinese mushroom with bean curd wrapping (HK$18) and crispy BBQ pork bun (HK$15). And yes, the last dish is commonly known as char siew bao, but have you ever tried it deep fried? Didn’t think so. I have been here a couple of times and seldom spend more than HK$50 a person for a satisfying meal. Now that you have fueled up properly for the day ahead, take a walk up the slope (you’ll need the exercise) to visit the famous Man Mo Temple at Hollywood Street. Feel free to explore the numerous antique shops dotting the area. By late morning, you should be ready for your next food adventure. Head down to Queen’s Road Central for a dose of Malaysian goodness in the form of Yeoh’s Bah Kut Teh. 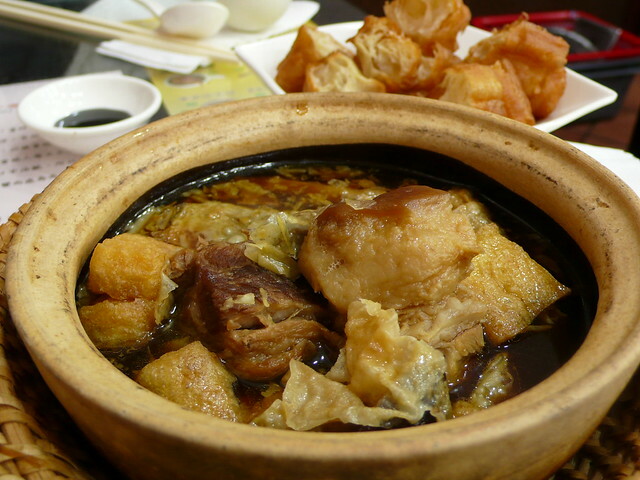 There are few places in Hong Kong where you can have authentic bak kut teh (pork cooked in herbal soup). Yeoh’s is one of them. This place serves set meals for two, but the portions are really good enough for three (approximately HK$130)! The highlights include a claypot of yook kuat cha (bak kut teh in Cantonese) and vegetables cooked in the style you prefer (I recommend the sambal belacan). What is the difference between the Malaysian and Singaporean versions of bak kut teh? The former is dark brown due to the heavy use of herbs, while the latter usually has a clear soup base with a strong peppery taste. After lunch, head down to the small streets of Sheung Wan to shop for dried seafood and the very herbs used to brew the delicious bak kut teh. If it wasn’t for my Singaporean friends who pointed it out to me, I would have totally missed the Honeymoon Dessert outlet located within the historical building of Western Market. This famous franchise whips up a dazzling array of desserts using tantalizing ingredients such as durian, mango, sago, ice creams, black jelly and sesame paste. 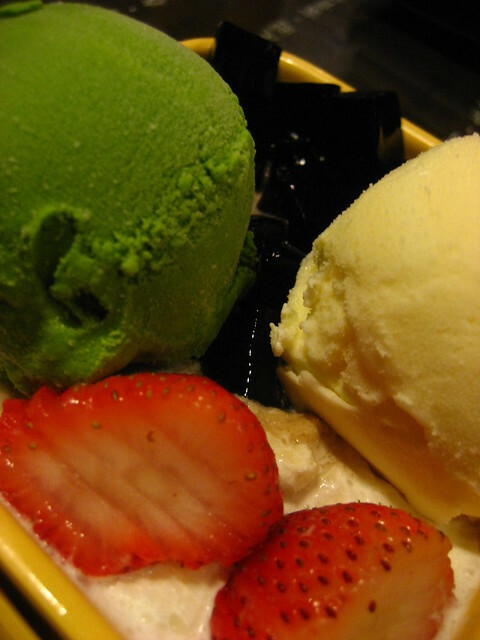 The dish pictured above combines green tea and vanilla ice cream with a spoonful of black jelly and sliced strawberry, all deliciously soaking in sweet vanilla sauce. Priced at a mere HK$38, it is a taste of heaven ’til the very last drop. If you have tried the same fares at the VivoCity outlet in Singapore, the real thing is much better! When you are done, head out to the nearby foot reflexology shops and have a relaxing foot rub before your biggest food adventure yet. They say you should have breakfast like a king, lunch like a queen, and dinner like a pauper. But let’s throw that to the wind while we’re on a foodie adventure! By now you should be ravenous enough to eat up a storm, and I would highly recommend going for the international buffet at Cafe 508, Trader’s Hotel (formerly known as Cafe Jen at Jen Hotel). It is situated at Sai Ying Pun. A cab ride there should cost you less than HK$30. Try to reserve a table in advance. Averaging at HK$220 a person (promotions vary daily), the restaurant is popular among locals who know a good bargain when they see one. The buffet spread may not be that fabulous, but this is where I had some of the best sushi, sashimi and raw seafood. 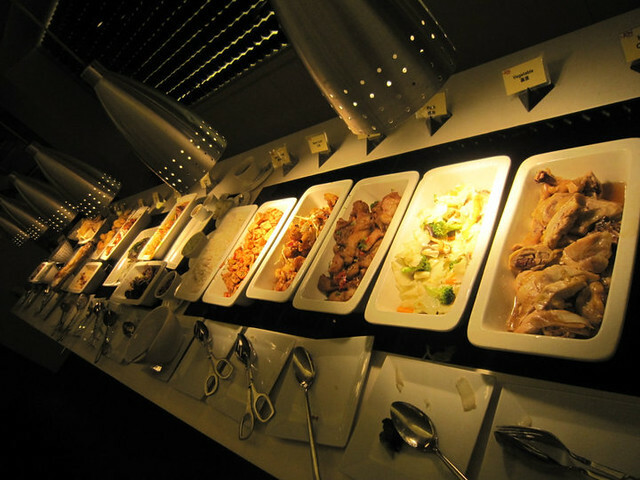 The cooked food items, encompassing Chinese, Western and Indian, are good enough for you to spend some happy hours by the buffet line. Also worth mentioning is the delicious array of desserts. You may want to avoid the cook-on-demand section though. All stuffed to the brim? Take a slow walk back to Sheung Wan and admire the sights of old buildings along the way. The stroll would take you some 30 minutes – just in time for supper! 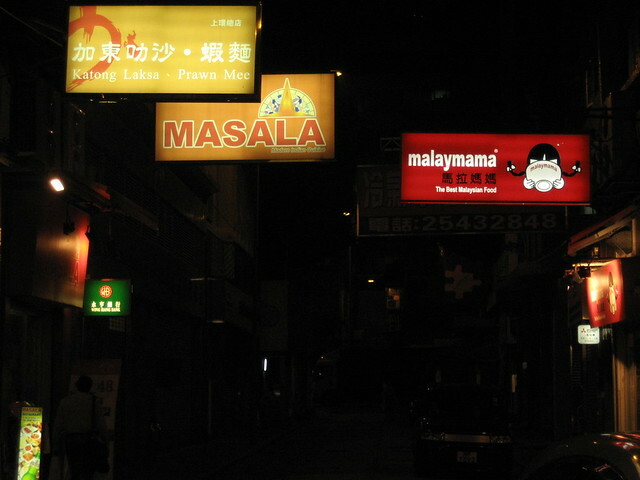 Your foodie day out in Hong Kong would not be complete without a daring experience eating by the sidewalk. 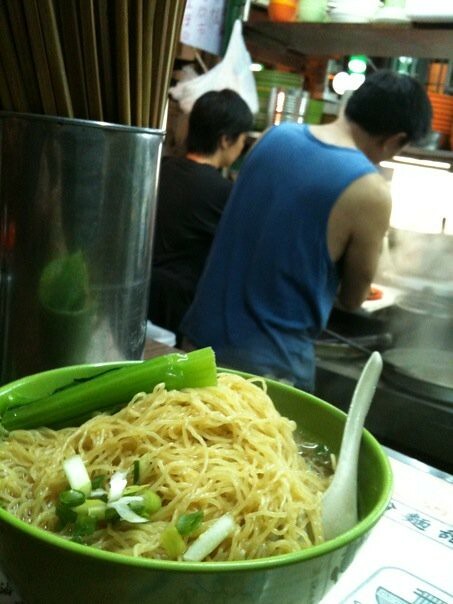 I encourage you to check out the popular wonton noodle stall at Hollywood Road. This stall is located on a hilly slope, complete with rickety tables and shaky stools. Now that’s an authentic roadside dining experience! 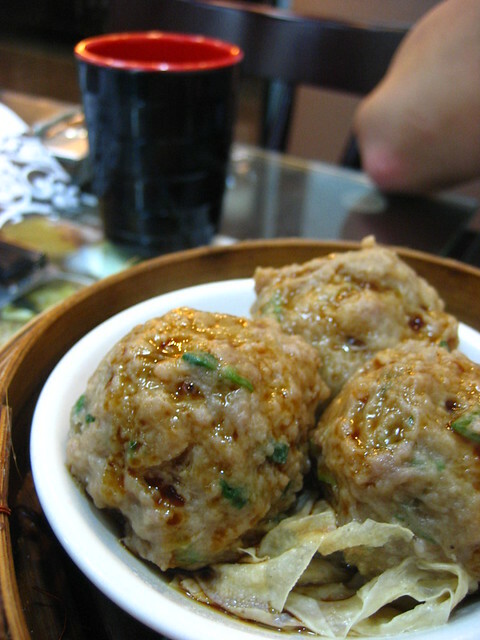 Hong Kong-style wonton noodle is commonly served in soup. If you want it dry, with char siew (BBQ pork) or chilli, you would need to ask for it specifically. For less than HK$30, this should last you for the night. Is your waistline ready for a major food invasion? If you are, then Sheung Wan should be part of your itinerary in Hong Kong! What other hidden gems are there in Hong Kong? Share with us in the comments! Razlan Manjaji is a self-confessed travel addict and food lover. When he is not expanding his waistline consuming copious amount of beer and seafood, he can be seen toiling away as a digital product manager for a living. Oh, and he loves to backpack his way through lands both familiar and foreign. Share his love for life at www.razlan.net. My friend read this post and said that the bak kut teh is not a difference between Malaysian and Singaporean… more like between Teochew and Cantonese. I wonder if anyone have insights on that? I am no bak kut teh expert, but the ones I’ve had here in Singapore are usually dark brown. Your friend may be on to something here. Er, isn’t the main difference that Malaysian BKT is basically the “medicinal” version full of herbs, whilst Singaporean is what we call the “pepper” version? I think you are right! I prefer the herbal type of bak kut teh, and Yeoh’s seems to be the only place in HK to get that.